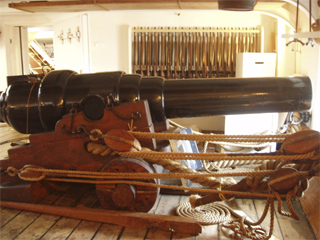 This page is an illustrated list of the guns in the order in which the guns are met when touring HMS Warrior. 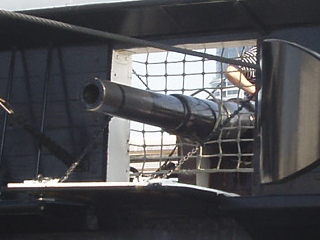 The 40 pounder was a larger version of Armstrong's earlier 12 pounder rifled breech loading gun. 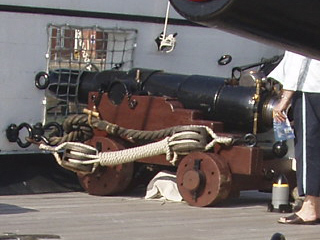 HMS Warrior orignally carried four 40 pounders, serial numbers EOC 186, 202, 204 and 205. All four have been lost or scrapped. 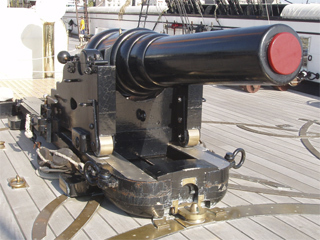 Today she carries a 40 pounder manufactured by the Royal Gun Factory in 1865, a gift from the Maritime Command Museum, Halifax, Nova Scotia, and three fibreglass replicas. The Armstrong guns were made from iron hoops forged together. The breech unit was supposed to be made from a single block of steel with a chamber bored out of it, but at the time the Warrior's guns were made Armstrong couldn't get the right amount of the right quality of metal. The breeches were therefore made up of staves, forged and heat welded under a steam hammer and then shrunk onto the guns when red hot. The rear of the powder chamber was blocked by a steel vent-piece, which was held in place by a breech-screw. In practice the vent-piece turned out to be the weakest part of the system. Generally the 40 pounder seems to have been a popular gun, at least with the people using it. When the Warrior was being armed the Armstrong 110 pounder RBL was still an experimental model; Sir George Armstrong had expressed doubts about using his breech for such a heavy gun. The gun is a bigger and heavier version of earlier Armstrong models. In practice there were problems with the operation of the gun. The vent-piece, which had to be lifted out of position after every shot, weighed 136lbs, and the integrity of the breech depended largely on how tightly the gun crew could turn the screw. 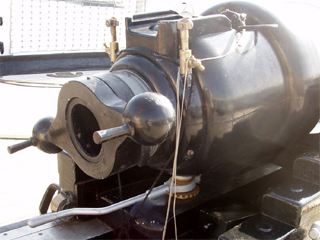 After a number of incidents in which the breech overheated and blew out the vent-piece the guns were withdrawn in 1863. There's a story that the rejected guns were sold to the American Confederacy, but it's apparently untrue, despite being in the Pitkin guide to HMS Warrior that Mr Monkey bought at the Royal Dockyard shop. Armstrong continued developing heavy guns, but only muzzle loaders. 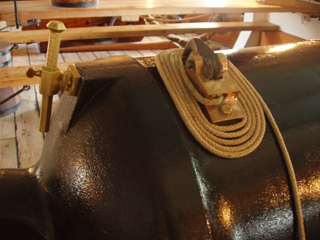 The Armstrong guns in the armoured citadel were mounted on two-wheeled carriages, held in place by ropes similar to those aboard HMS Victory. 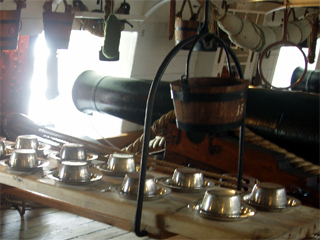 The 68 pounder was essentially a big version of the guns aboard HMS Victory, only with a more efficient percussion cap firing system and an adjustable sight.